What is Glass Fiber Reinforced Concrete (GFRC)? The glass fibers of the GFRC used for AFD products has a higher tensile strength than steel or concrete and a much higher flexural strength than normal concrete. As a general rule, the higher the fiber content, the higher the strength. With the thin, hollow construction of GFRC products, they can weigh a fraction of the weight of traditional pre-cast concrete. American Fyre Designs (AFD) focuses on function in addition to form. GFRC allows incredible design freedom with shapes and textures, and the colors of nature were abundantly available for experimentation within the concrete. 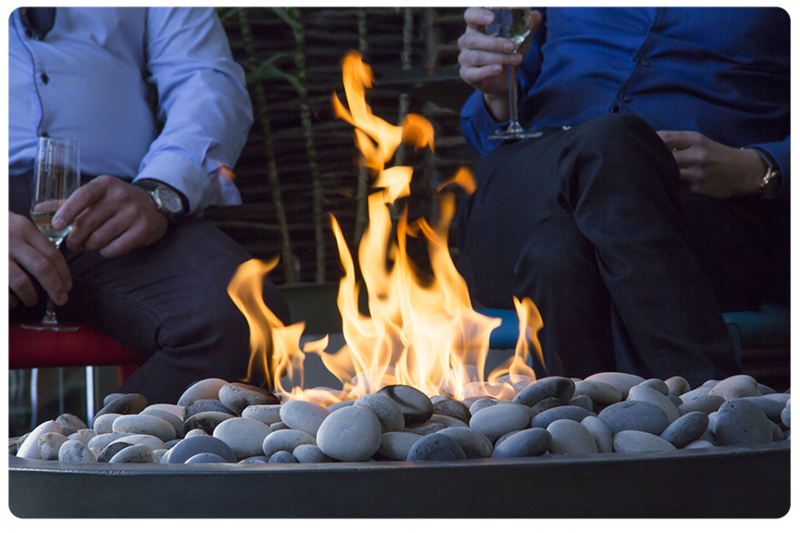 Our manufactured GFRC designs incorporate the fires and flames of Real Fyre gas logs and other RH Peterson products into a distinctive and luxurious line of outdoor furnishings, including exterior fireplaces, firefalls, firetables, fire pits, fire urns, fire bowls, BBQ Islands, and more. Made of minerals that will not burn. In addition, the nature of the concrete is to act like a thermal regulator when exposed to flame. This means that GFRC not only will not burn, but it also protects the materials behind it from the heat of the flame. GFRC is thin, yet strong and weighs considerably less than solid concrete – about 75% to 95% less. This means there is less chance for damage and makes it easier and faster to install. The lighter weight and stronger material also saves on transport costs, allows for more design freedom, and reduces the environmental impact. GFRC lasts. It is unsusceptible to weather erosion and is more freeze-thaw resistant than conventional concrete. The use of glass fibers for reinforcement rather than steel means it cannot rust even in the harshest marine environments. In addition, the existence of glass fibers provides a crack-arresting system. GFRC provides the look and feel of natural stone. It also allows AFD’s designer more freedom in shape, color and texture than any other material. Form and function unite to give an outdoor living space a luxurious product than can be enjoyed for many years. Used in conjunction with Real Fyre’s variety of gas logs and stones, fyre glass, fyre gems, and diamond nuggets, these finished products transform any plain outdoor landscape into a fanciful paradise. GFRC’s flexibility, durability, strength and beauty all combine to create the form which becomes functional and fanciful by adding fire. Decorative concrete artisans for AFD have perfected the GFRC mix so that virtually any creation imagined can be designed and cast. These applications include AFD’s exterior fireplaces, firefalls, fire pits, and fire urns, as well as BBQ Islands and counter tops for Fire Magic and American Outdoor Grills products. The GFRC used in the AFD product line has been thoroughly tested both by accelerated aging tests in the laboratory, including the RH Peterson Lab as well as in real life installations. Our products will last at least as long as any quality cast-concrete but will look better over time. This is because GFRC can be expected to withstand environmental conditions, especially high moisture or salt spray areas, better than regular cast-concrete since there is no steel reinforcement to corrode. Also, because the surface of the GFRC we use is a Portland concrete, it weathers in much the same way a quality architectural pre-cast concrete would. GFRC has a much lower environmental impact than conventional concrete, stone, or other materials. Made with naturally occurring minerals and aggregates, GFRC requires less manufacturing and uses products made by Mother Earth. The pigments are blended with the mix so the color is cast all the way through the product and won’t scrape off like an applied, painted finish. We offer eight colors and two different textures to choose from. How GFRC products are created at RH Peterson Co.
GFRC is a slightly more complex process than a typical concrete pour, requiring a lot more attention to detail. Instead of pouring concrete into a form in a single fluid motion, the GFRC is layered within the mold, each layer having a specific function to the success of the piece. The part is constructed upside down on a flat surface and the layers are either hand laid or sprayed into the mold. The first layer of concrete is about 1/8 inch thick. After this layer hardens, but before it dries out, a second thin layer is added, this time with fibers in the mix. This layer is then rolled out to eradicate any lingering air pockets and this mechanically bonds the layers together. Finally, the rest of the concrete with the now-infused fiber can be added into the mold to finish the process. This finished product is a thin, hollow construction of GFRC, and is typically ½ inch to ¾ of an inch thick.